In 2017, I was in Hotel Paraktio in Nea Kallikratiaand decided to give Petralona Cave a visit. I’ve read about the place so many times, but this seemed like the perfect occasion to finally see the popular sight and all it has to offer. Petralona Cave is located in northern Greece, and only a short distance from Thessaloniki, which makes it a great day-trip idea! It took us half an hour drive from Nea Kallikratia to Petralona Cave on a very hot summer day. The weather was perfect for adventures in the Balkans and we were looking forward to exploring the magnificent cave. The road to Petralona Cave is quite good. We had GPS to lead us, so we didn’t get lost, but there are lots of road signs on the highway to help you get there even without GPS. Visitors are required to leave their cars in an asphalted parking lot that’s about a 10 minute walk, where you can also find shops and a small coffee/bar. In the parking lot, a bus collects tourists and then takes them up to the cave, which is around a 2-min drive away. Of course, you can walk if you don’t want to wait for the bus. What the Petralona Cave Tour is like? Tours are organized around 10 minutes after the bus gets to the cave and museum area. At the time of our visit, there were around 15 other people with us, so it can get crowded. There is a tour guide, but the guide doesn’t really explain too much about the cave, just adds short remarks at certain points. However, I liked that because I often prefer to just enjoy the atmosphere rather than concentrate on what’s being told. Taking photos inside the cave is forbidden, however, visitors can take photos in the museum that is right next to the entrance of the cave. 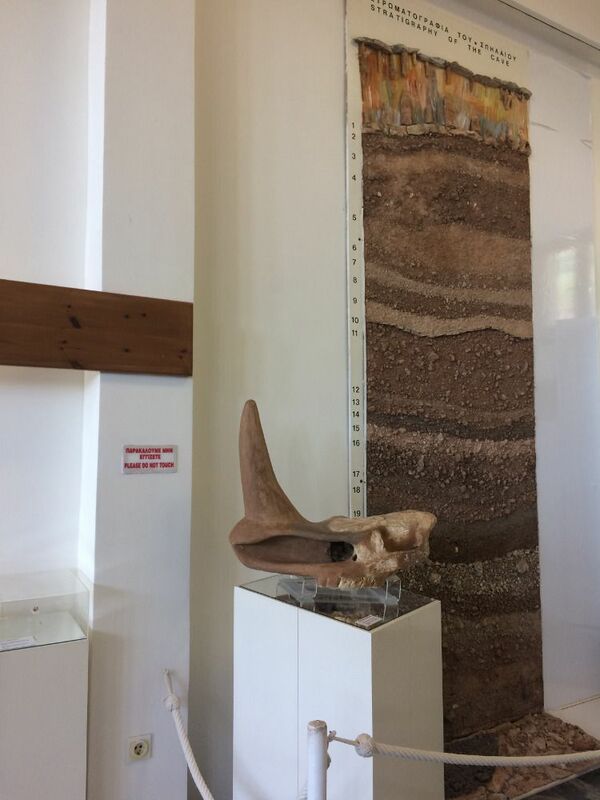 In the museum, there are lots of findings from inside the cave as well as a reconstruction of the site where the Petralona Skull was found. There’s no entrance fee for the Anthropological Museum of Petralona. Petralona Cave is located in Chalkidiki, Greece or, more precisely, on the western foot of Mount Katsika. This marvelous spot is around 35 kilometers away from Thessaloniki. Petralona Cave or the Cave of the Red Stones is a Karst formation. The cave also boasts with marvelous stalactite and stalagmite formations as well as lots of fossils. It is, however, the most popular for the discovery of the Petralona Skull, which is considered the oldest European hominid skull ever found. This cave was discovered in 1959, but it first came to public attention a year later after the discovery of the Petralona Skull. At the time of my visit, the ticket price for the Petralona Cave was €8 per person. Not to expensive and totally worth it I’d say. Cars are left at the parking and from there you can get a bus to the top. It’s a 5-minute drive and at the time of our visit it was free of charge; otherwise, you can walk up the hill to the cave’s location from the parking lot. All in all, I loved my trip to Petralona Cave. 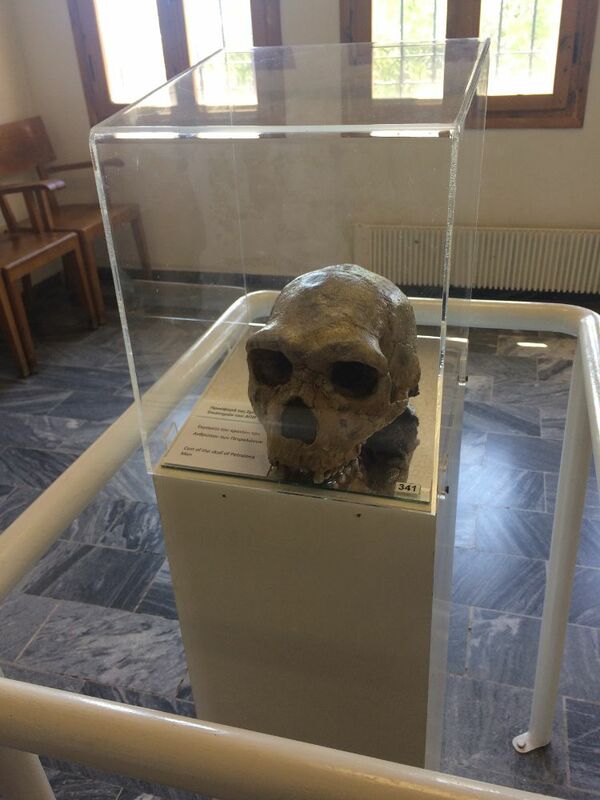 This landmark has an incredible value and it is the place where Europe’s oldest hominid skull was discovered. Even those that don’t care about the historical segment of Petralona would surely love its levels and amazing stone formations. Inside the cave, you enter a different universe where various animals and even prehistoric humans used to live; hence, being there offers a simply magical experience that anyone should feel for themselves.